Our latest project is the architectural planning and interior design for the our one of our client Mr. Abdullah Qazi. 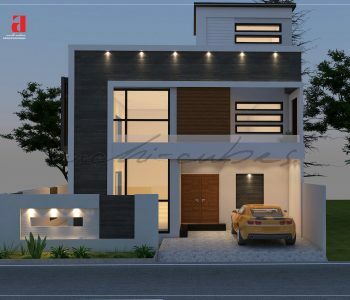 The pleasant use of modern textures for the architectural detailing is meant to suggest prosperity, high spirits as they provide a lot of visual stimulation for the family as well as the guests. 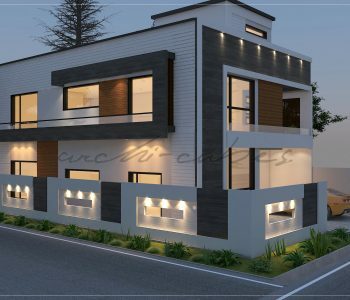 The 10 Marla house based on the modern lines was conceptualized as an idea and was shaped into a minimalist form by the designers at archi-cube. The pearly white exterior gives it a feeling of purity and serves as a good shield against the harsh summer temperatures of Lahore. The subtle play of color with ash grey and brown accentuates the form highlighting its horizontal and vertical. Moreover, the modernist windows with black mullions create a dialogue between outside and inside giving warm washes of sunlight in the interior. The terraces on both the facades also act as loggias to enjoy the weather. All in all the thoughtful design was made to utilize space efficiently within the limited parameters. The live spirited ambiance of the building is additionally evident on the outside through the employment of daring colours balanced with the natural “Green’.